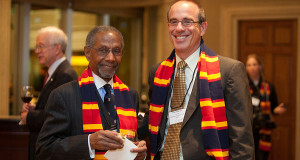 The Queen's University Alumni Association and the Alumni Branch network offer a number of annual awards to recognize alumni and other members of the Queen's community who serve Queen's and the world at large in exceptional ways. 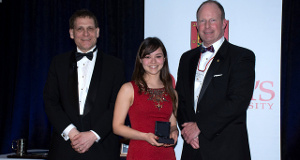 Learn more about Queen's Alumni Awards, their past recipients and how to nominate someone. 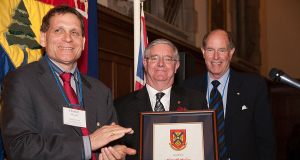 The Alumni Achievement Award is the highest honour presented by the Queen’s University Alumni Association. Presented annually to a Queen’s teacher who shows outstanding knowledge, teaching ability, and accessibility to students. Presented to a Queen’s alumnus/ alumna in recognition of distinguished work or volunteer service, at home or abroad, which has made a difference to the well-being of others. Presented annually to an alumnus/alumna who has made a significant and ongoing contribution through mentorship either to an individual or group. Presented annually to an alumnus/alumna in recognition of volunteer service to the life of and work of the Queen’s University Alumni Association, either through short-term impactful involvement or long term commitment. Presented annually to recognize the initiative, including events or activities that most successfully contributes to the life and work of the Queen's University Alumni Association. Presented annually to the alumnus/alumna who best exemplifies Marsha Lampman's outstanding dedication and service to a Branch of the Queen's University Alumni Association. Presented annually to a recent alumnus/alumna (fewer than 10 years out) from either an undergraduate or graduate program who is making significant contributions in their field of endeavour, setting an example for future Queen’s alumni to follow. Recognizes a current Queen’s student who has helped connect alumni and students. The student’s contribution(s) can be made in the year of nomination or over several years. Presented annually to a new (within the last two years) alumni association volunteer whose exemplary contribution and commitment set an example for others to follow. 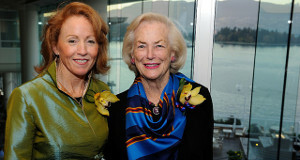 Presented biennially by the Ottawa Branch to an alumnus/ alumna for distinguished service to the University and Canada. 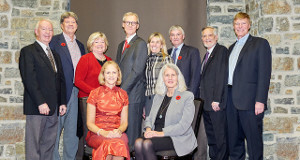 Presented by the Kingston Branch to a Kingstonian to honour outstanding achievements in careers, sport, the arts, or volunteer endeavours, contributing to the betterment of Queen’s or Kingston. 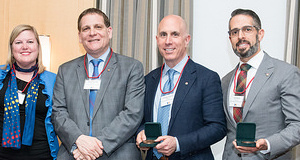 Presented biennially by the Montreal Branch to an alumnus/alumna who is a “maker of Queen’s” rewarding meritorious contributions to the honour of the university. Presented annually to an alumnus/alumna for significant contribution to the life and welfare of Queen's University. 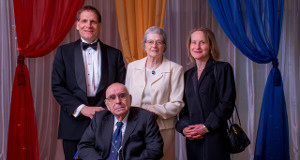 Presented biennially by the Calgary Branch to the alumnus/alumna who have made lifetime contributions to Queen’s University, the Alumni Association, and the Calgary community. Presented biennially by the Vancouver Branch to an alumnus/alumna who best exemplifies outstanding service, passionate advocacy, dedicated support, and contributions to the betterment of our University and our country. 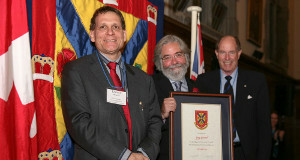 Presented by the Kingston Branch to a degree recipient, usually a resident of the Kingston area, for outstanding service to Queen's University or jointly to the Queen’s and Kingston communities. 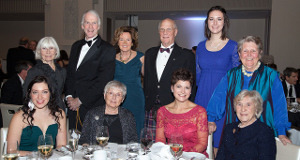 The Grunnan Onarach (Gaelic for "Honour Group") was established in 1988 by the Ottawa Branch of the Queen's University Alumni Association to commemorate its 100th anniversary. The Toronto Branch Award is presented to Toronto-area alumni who have distinguished themselves in their careers, in their volunteer work, in the arts, or in other ways they have contributed to society. Members of the Queen's community who have an idea for an innovative program that enriches the University may qualify for special project funding from the Queen's University Alumni Association. Awarded annually to women graduate of Queen's University for a year of study and research, or to pursue an endeavour that contributes to the advancement of knowledge, contributes to society or allows creative expression.